For an ideal I⊆ℝ[x] given by a set of generators, a new semidefinite characterization of its real radical I(V ℝ(I)) is presented, provided it is zero-dimensional (even if I is not). Moreover, we propose an algorithm using numerical linear algebra and semidefinite optimization techniques, to compute all (finitely many) points of the real variety V ℝ(I) as well as a set of generators of the real radical ideal. The latter is obtained in the form of a border or Gröbner basis. The algorithm is based on moment relaxations and, in contrast to other existing methods, it exploits the real algebraic nature of the problem right from the beginning and avoids the computation of complex components. Lasserre, J.B, Laurent, M, & Rostalski, P. (2008). 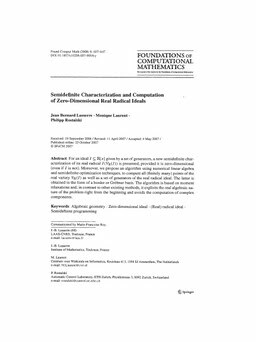 Semidefinite characterization and computation of zero-dimensional real radical ideals. Foundations of Computational Mathematics, 8(5), 607–647.